Once a year I normally have a day fishing on the Dever Springs Fishery. It stocks with extremely large brown trout and a good average size of rainbows. I was to fishing with Ross and Mike a couple of guys I had fished with before. Now I don’t normally have the equipment for these fisheries so I had to borrow the tackle from Sir Geoff and Steve, so big thanks to them. I have small stream trout gear but not the heavy flies and rods and reels. Most of mine are a #3 rod and line perfect for small trout. The morning in question was cloudy with little breeze. I picked Mike up from the train station at Whitchurch which is 10 mins or so away and at 8am we were at the fishery. I think we must have been late as there were plenty of others ready to fish. With tickets bought we headed off to the smaller lake to see what was around. The lack of sun made it difficult to spot and stalk fish. Also there was an algae bloom in the lakes from the great warm weather we had a few weeks ago. I found a good spot where I could see the odd trout doing a circuit. 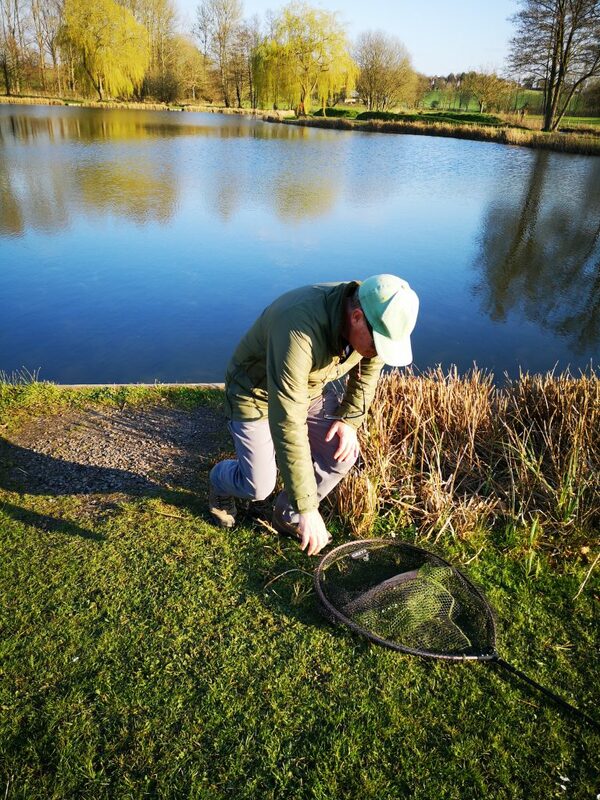 I had a large heavy fly on the end and several times the trout turned to investigate the thing. It wasn’t long before I had the first fish from the lake a nice rainbow of about 5lbs. So no blanking! I carried on looking and found a really big brown trout holed up near a willow tree. Then another chap turned up on the other side of the tree and spooked the trout. I then carried on walking around finding plenty of trout showing but not feeding. Then just before lunch I had two trout very quickly I suspect it ones they stocked recently. Ross was struggling which is very unusual however Mike had his 4 fish limit early on and went on to buy another 2 fish limit ticket. All the fish were between 5-7lbs so a great average size. So we had lunch and chatted as the sun poked through the clouds to warm the air. It was about 2pm now and the fishery closes at 5pm so Mike competed some work while Ross and I headed off to see if we could catch a few more. I walked and walked around both lakes and saw one or two big brown trout however they didn’t return to the same spot. I wandered back to the smaller lake where a chap had spotted the big brown trout and had been chasing it. But again it was being very elusive and didn’t show often. He had a rainbow and that was his limit. I continued looking and seeing the brown trout occasionally but not having an opportunity to cast to it. There were one or two big double rainbows lurking around and they kept coming in but didn’t chase the fly. By now time had flown by and it was 4pm, so I had one more fish to catch my limit. So I left the brown trout and wandered around until I found a trout to tempt. 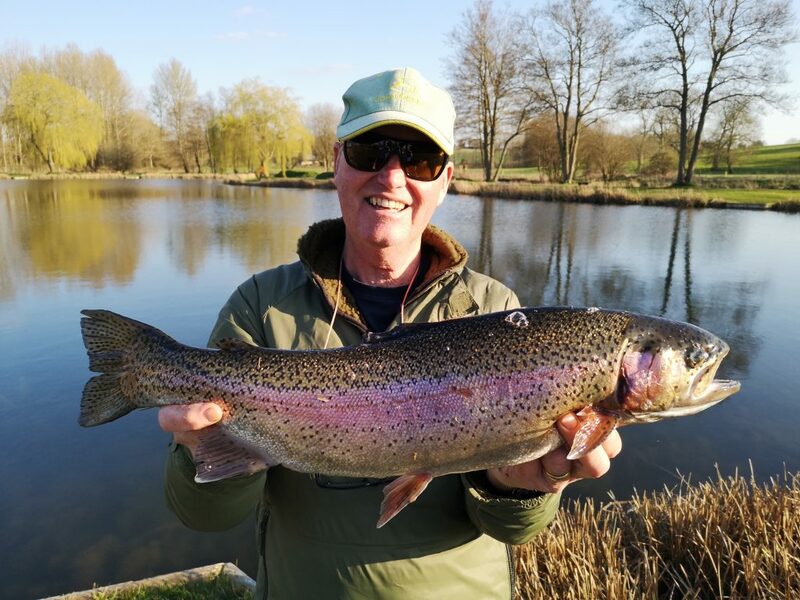 I couldn’t believe it when casting just in front of it allowing the fly to drift down to it’s level the white lips opened and I struck into a lovely trout of about 5lbs. So that was it for the day a full limit in some great company. Dropping Mike off back at Whitchurch train station we said our goodbyes and off back home I drove. Got to say that the fishery gives an excellent chance to catch good conditioned trout. I look forward to returning soon. This entry was posted on Wednesday, April 3rd, 2019 at 4:20 pm	and is filed under Uncategorized. You can follow any responses to this entry through the RSS 2.0 feed. Both comments and pings are currently closed.